Dinner rolls with fresh rosemary, and filled with asiago cheese and brushed with garlic butter, are very special indeed. Dovetailing tip: Take out the mashed potato that you saved in Meal 1 to add to the rolls. -Prepare dough: add 1 teaspoon of sugar to warm water, and mix with a fork to dissolve; sprinkle yeast on water and mix to dissolve; allow the yeast mixture to sit for 10 minutes, until foamy. -Meanwhile, add milk, butter, sugar and salt to a small sauce pan, heat on low until the butter is melted; do not boil. Cool slightly. -Add the milk mixture to a large bowl; add mashed potato and eggs, mix using a mixer on low speed until well blended, about 1 minute. -Mix in 2 cups of flour and rosemary leaves until smooth. -Add the yeast mixture, and mix well. -By hand, add in the remaining flour, and stir to combine until a dough is formed. -Place dough on a floured work surface; knead for 4-6 minutes, adding more flour in small amounts, as needed, until the dough is smooth and elastic. -Grease a large bowl with butter. Add the dough to to bowl, turning once to grease both sides. Cover with plastic wrap and place in a warm place and allow it to double in size, about 1 hour 20 minutes. -While dough is rising, make filling; add ¼ cup butter to a small saucepan to melt; remove from heat and add garlic; stir. Cover to keep warm. -Line a baking sheet with parchment paper; mist with cooking spray. -Once the dough has doubled, punch it down, and turn it out onto a floured work surface. -Roll dough into a rectangle shape, about ¼” thick (it will be fairly large); brush dough with the “garlic butter”; reserve 1 tablespoon to brush over the rolls before baking. 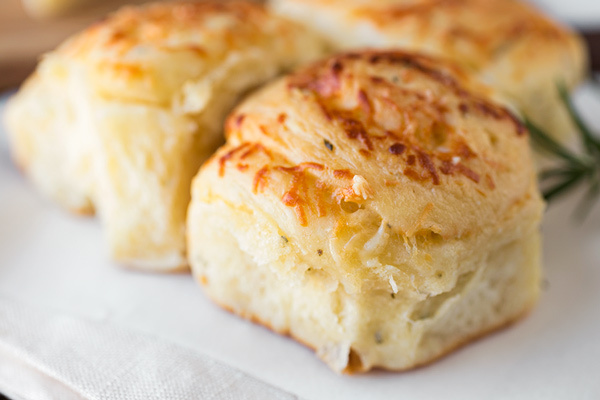 -Sprinkle 2 cups of the grated asiago cheese evenly over dough. Start from the top roll dough tightly, pinch edges to seal. -Using a string or sharp knife, cut log into 1” slices; place with sides touching on prepared baking sheet. -Cover with plastic wrap, and allow them to double in size, for about 40-45 minutes. -During the last 15 minutes, preheat your oven to 350°. -Brush the rolls lightly with the remaining tablespoon of garlic butter, and sprinkle over the remaining ½ cup of asiago; bake for about 24-28 minutes, or until a pale golden color, and serve warm.